Mother of a show: Even having a daughter can't blunt all the sharp edges on comic Sandra Bernhard, who brings her one-woman show to the LBC Sept. 1.
WHO'D HAVE GUESSED? Turns out comedian Sandra Bernhard is like one of those football players that confuse us so much. You know the ones: On the field, they wreak bloody havoc, ferociously demolishing the opposing team and sending quarterbacks out of the game in body bags. Then, when a timid sports reporter catches up with them later in the locker room, they turn out to be pretty regular people. A little quiet. Even sweet. Of course, Bernhard isn't exactly tame, but she certainly isn't as edgy over the phone as you might expect from her reputation. "I think people are a little bit intimidated by me," Bernhard admits with a laugh. "You know, I'm not exactly a wilting flower, so I think they're a little bit scared of me sometimes." Speaking from a hotel room during a stop in San Diego, Bernhard is in the middle of explaining why she doesn't have much trouble with celebrity stalkers. But she's also just put her finger on one factor that helped catapult her out of the teeming ranks of the '80s stand-up crowd and into the world of multimedia celebrity. It's the 45-year-old comedian's curious combination of tough talk and emotional vulnerability that keeps audiences hungry for more, whether Bernhard is delivering her humor in the form of a semi-autobiographical book (she's had three published, including the most recent, May I Kiss You on the Lips, Miss Sandra? ), on television in her former role as the lesbian character on Roseanne, or in her current hugely successful stage show, which combines stand-up comedy with cabaret-style musical numbers. Bernhard made a triumphant Broadway debut with "I'm Still Here . . . Damn It! ", the show she'll be bringing to the Luther Burbank Center on Sept. 1. According to the critics, this performance piece doesn't stint on venom: The New York Times calls it "an angst-driven, foul-mouthed, poison-laced joy ride" through the worlds of fashion, rock, and religion. We expect jokes about Mariah Carey, but Bernhard even goes after Mother Teresa. But the emotional vulnerability is there, too. And that, according to Bernhard, may actually be more surprising to audiences who have become numb to the in-your-face antics of modern comedians. "I tend to go against the grain because when I start to see that everybody's trying to shock, I try not to," Bernhard explains. "I just do stuff that's subtler, more emotional, and I think that shocks people. "In one of my books, the line was 'Love is the only shocking act left on the face of the earth,' " she continues. "I think that being real, being honest, being emotional are all things that disarm people, much more than just being a smartass." And if you want to hear this edgy comedian get really mellow, ask her about life with her 2-year-old daughter. "You have to really cultivate your patience level to extreme highs because when they need something or want something or can't comprehend something, you have to be there to explain and be patient," Bernhard says. Has becoming a mom changed her outlook on life? In a way, answers Bernhard. "I think it's just given me another level of confidence and inner strength more than anything," she says. "In terms of my point of view, that's always evolving anyway. But certainly when you have a kid, you want the world to be an even safer, smarter place than when you were on your own, 'cause you want your kid to grow up into some semblance of sanity and happiness." BERNHARD began her stand-up career at the tender age of 19, working in comedy clubs in Los Angeles. Two years later, her first big break came along when she was made a regular on the short-lived Richard Pryor Show. Making the rounds on the country's comedy circuit in those days offered equal parts stultifying boredom and dangerous misadventure. Bernhard had to be prepared for anything, as she explains in Love, Love, Love, her second book: "I usually drove alone, and I carried a gun that I had to use when a club owner set me up in the parking lot with a couple of guys who tried to rip off my $1,200 in cash. They backed off quickly, but after that I threw the gun into a garbage can at a Sunoco station on some dismal turnpike, knowing all too well I was probably on the verge of using the damn thing." Her career has come a long way since those dangerous days. She has several high-profile film roles under her belt (most notably as a psychotic fan of talk-show host Jerry Lewis in King of Comedy) and writes regularly for magazines ranging from Spin to The New Yorker. She also hobnobs with the biggest names in pop culture, including Madonna. That relationship, which was once very close, took on a new dimension in the public's mind when Bernhard came out as a lesbian some years back. These days, Bernhard doesn't have too much to say about the Material Girl: "We haven't hung out in many years, but when I see her, it's all pretty cordial," she explains. After her daughter, Bernhard's biggest joy in life seems to be collaborating with her music director, Mitch Kaplan, to create the songs that form an integral part of her stage shows. "My first love was music, and I really wanted to be a singer, which I kind of ended up being, but I took a more circuitous route by starting in the stand-up world," she explains. She also continuously revises and refines the comedic portion of her act. That means that the "I'm Still Here . . . Damn It!" she stages in Santa Rosa won't be quite the same as what audiences saw on Broadway. "The outline is the same, but since then I've rewritten quite a lot of the material and there's a lot of new stuff," Bernhard says. "Also, there's a lot of improvisation, which makes it more current and gives people a little more than what they think they've seen already." Bernhard also has a new show in the works. She has already performed "Songs I Sang in the Kibbutz" at a comedy club in New York, and she soon expects to take it on the road. "Some of it's kind of ironic, and some of it's really serious rock and roll," Bernhard says. "And it goes all over the place musically, from Bobby Womack to three original compositions to AC/DC's "You Shook Me All Night Long." "But as always," she continues, "it comes together in some sort of unexplained way." 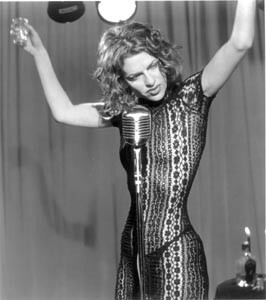 Sandra Bernhard performs Friday, Sept. 1, at 8 p.m. at the LBC, 50 Mark West Springs Road, Santa Rosa. Tickets are $18.50-$25.50. For details, call 546-3600 .